Here’s the response I got from my snake “friend” about the photo in the last post. It looks to be to be a young Bull Snake (Pituophis catenifer sayi)…harmless but aggressive, though they can get about 6 feet in length as adults. Go ahead and pick it up so you can get bitten and get it over with just so you’ll know that snakes bites aren’t so bad and are nothing to worry about. Let me think about that for a bit. We were excited to be back on the road again after a very cushy month in our rental house. 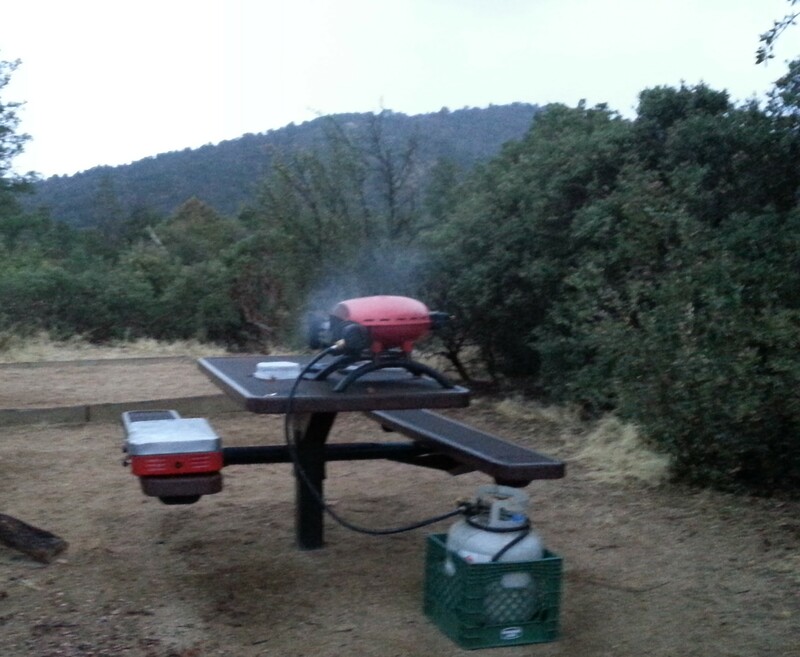 Ominous weather forecasts for the Prescott area didn’t dampen our enthusiasm for returning to the Yavapai Campground in the National Forest there. Our friends, Vern/Ilene Baker, who also own a T@DA, bailed out of joining us, citing weather concerns. Cowards, we thought! We arrived under darkening skies, picked our favorite campsite and got set up before darkness settled in. Put up our big Thermarest awning, to give us an added bit of shelter (and a great foot-wiping station for Jezzy). 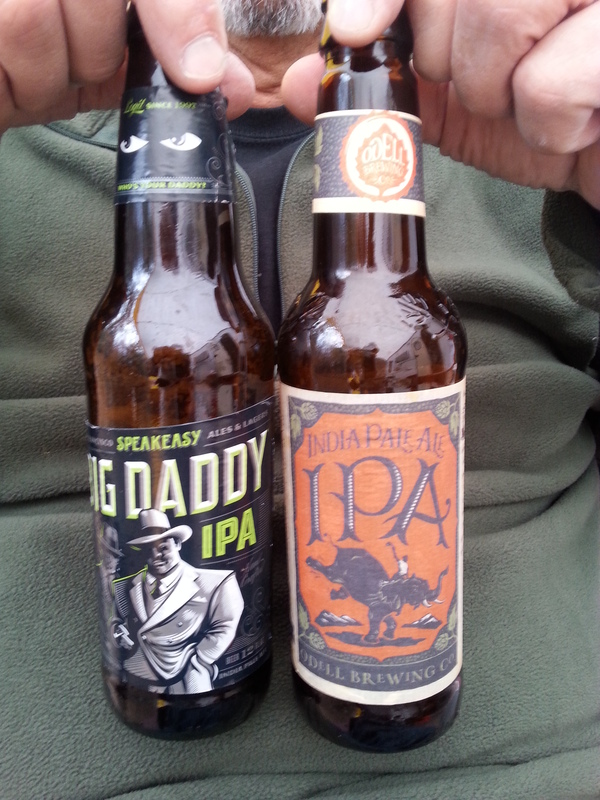 Toasted our return to camping life with IPAs. As the first few raindrops spatter down, we decide to quickly grill the Italian sausages and peppers we planned for dinner. 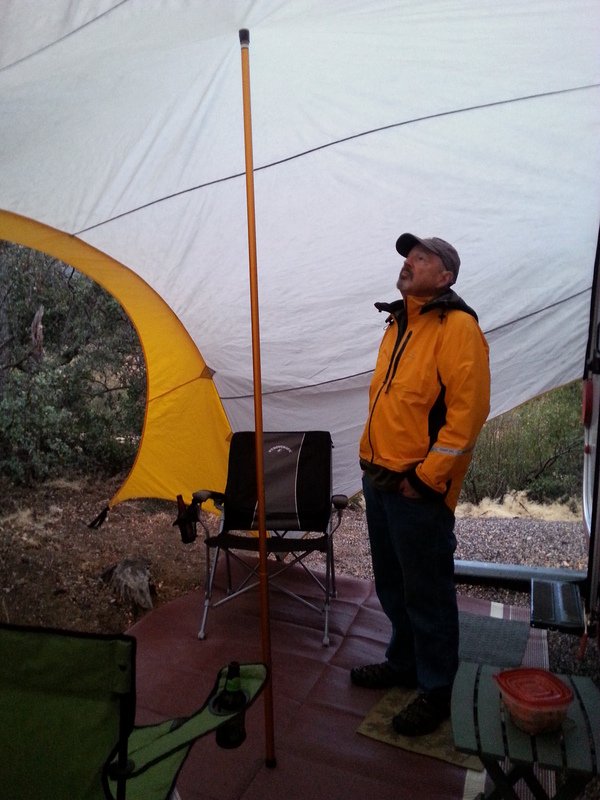 The rain picked up – we put up our rain pole, which helps to keep too much rain from pooling in the awning. “Bring it!”, we foolishly thought. Holy Cow! About six inches of rain later, accompanied by 30mph winds, we called Uncle. The Saturday night forecast called for 3-6 inches of snow above 6000 feet. We were at 5800 feet, with a treacherous downhill road to exit. It’s been a long time since I’ve been in a storm like that. We could just see Vern/Ilene smirking at our departure. So we bailed out, and headed to Vegas a day early, enjoying most spectacular storm skies along the way. We’re regrouping at my sister’s house, and will head out to Death Valley tomorrow. Just a bit of an ominous beginning to a couple months of camping. This entry was posted in Arizona, camping, Nevada, retirement, simple camping, T@DA, weather and tagged Arizona, camping, family, retirement, road trip, simple camping, T@DA, the great outdoors, weather by Judy Crankshaw. Bookmark the permalink. Enjoying your blog and adventures. My wife and have similar aspirations of traveling and biking your way. One thing I did not get from your blog was how you are able to afford to travel and your expenses. I know this is not a retirement/financial blog, but some general info would be great for us wannba-bes. Sorry to take so long to respond. We have had very little signal these past days. We live pretty modestly. Small house, just one vehicle. You will notice from our photos that we seem to have just two changes of clothing, so obviously we’re not big shoppers! When on the road, our big expenditure is gas. Our best days are when we’re not moving, but settled into a campsite. We try very hard to Not drive once we arrive in camp. Mostly, we will cycle to stores for last minute stuff, and we always try to resupply before arriving. So, fuel is a biggie, but a necessary evil. We camp cheap, when we can. We like National Parks – with our senior passes, camping is usually $9 or $10 per day. Full hookups? Don’t need. We like to be off the grid. John invested in a new 120 watt Zamp solar, and we are delighted with it. In our opinion, private RV parks are to be avoided unless location is critical. State Parks and county parks are good, too. We want to be outside, have a picnic table, and a fire ring. Campfires are essential! Don’t watch TV, so we don’t care about that. We love free WiFi, but its rare. Our cell phone bill is substantial while we are on the road. Access is a necessary evil, but the best camps are the remote ones where access is scarce. Go figure. Food, etc. Is the same whether we are camping or at home. We don’t eat out a lot, but eat very well in camp. The grill is always smoking, and we’re both great cooks. We do cheap out on some entertainment. Every $10 museum or attraction gets scrutiny from me before I can part with the dough. Doesn’t cost much to keep our house empty while we’re gone. Heat low. Biggest expense this year will be paying off our neighbor girl to shovel our sidewalk while we’ve been gone! Gotten off cheaply in this respect for the last couple of years, but it’s payback time! Hope this helps out. We don’t know how long we will want to camp like this, with luxury at a minimum, so we’re trying to squeeze as much out of it as we can, while we can. Glad you are safe. Sad we missed you. Not sad we missed the weather. Very jealous about Death Valley. Never been there, one of my life list places. You’re not too far away from Death Valley. Put it on your spring camping list. You’ll be a happy camper. Prescott would have been okay with buddy campers. So glad you are safe and sound. Enough is enough. I would have bailed at the snake!!! Happy birthday! We are already all over that, and looking for new things to scare us. Wish you were here…..Death Valley is unusual, and fun. Lots of Casita campers around. Glad you made it out safely! Wow………….the wind & rain sound like a handful. You made the right choice. Go find some nice temps & dry roads. Wise decision on the bailing! 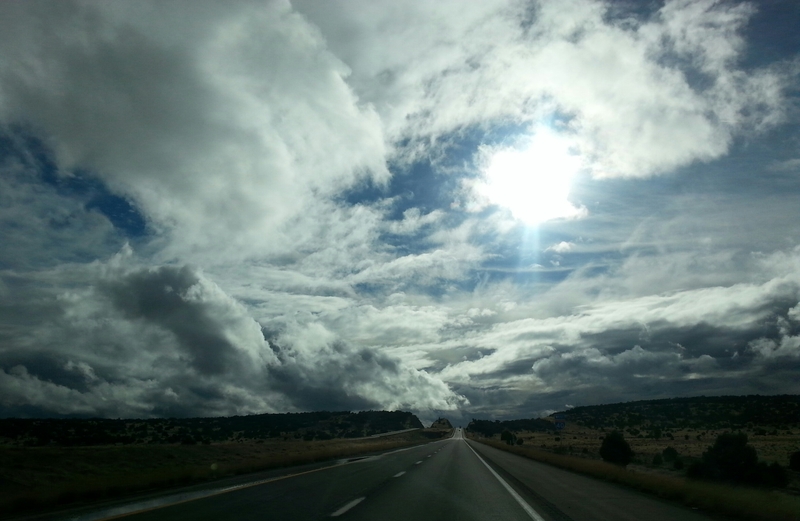 The western weather does not fool around….thought we were going to get blown over in west Texas. The locals would probably call it a mild breeze! The winds at this time of year are aweful, aren’t they? We had one of our worst days ever on the road last year around this time of the year due to wind. It’s not to be trifled with, especially when towing. You don’t want to fool with Mother Nature, I hope that things smooth out for the rest of your trip! We could use a jackpot! Wise move. Enjoy Vegas. It’s a riot of craziness. Crossing Death Valley was one of my favorite “weird” travel experiences. Miles and miles of flat land with not a bush or tree or telephone pole, or fence and then suddenly a sign saying “Cattle Crossing” or “Watch for Low Flying Aircraft”. That was in the 60’s. I wonder if they’re still there. Have a blast. We are really looking forward to exploring Death Valley. Full-on tourists!